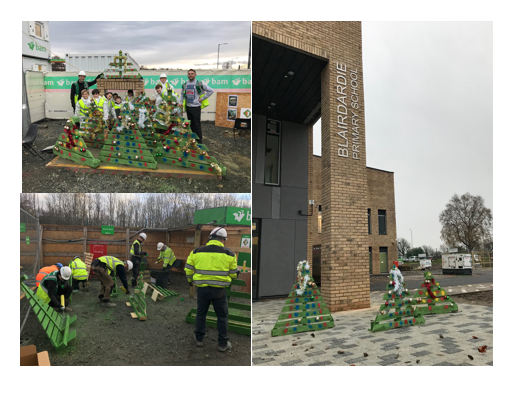 BAM Construction entered into the spirit of Christmas by constructing some Christmas Trees made from discarded pallets at the site of the new Blairdardie Primary School. They were joined by some helpers from the current school who helped to decorated them. This is a fantastic example of using discarded materials and up-cycling them for the benefit of the community. The new school is due for completion in February and the addition of some very special Christmas Trees, which will be displayed on Kearn Avenue, has certainly brightened up the site.